Hampton Inn by Hilton Denver West Golden welcomes guests to Golden this holiday season with a fantastic package. Guests looking to spend time in Golden this winter can book the Home for the Holidays Package for $99 per night. Guests will be able to eat, sleep and be merry this holiday season with deluxe accommodations and “On the House” breakfast. With a choice between king and double queen rooms, this package is perfect for families visiting Golden. Locals with limited space can have their family stay close this holiday season, without having grandma sleeping on the couch. 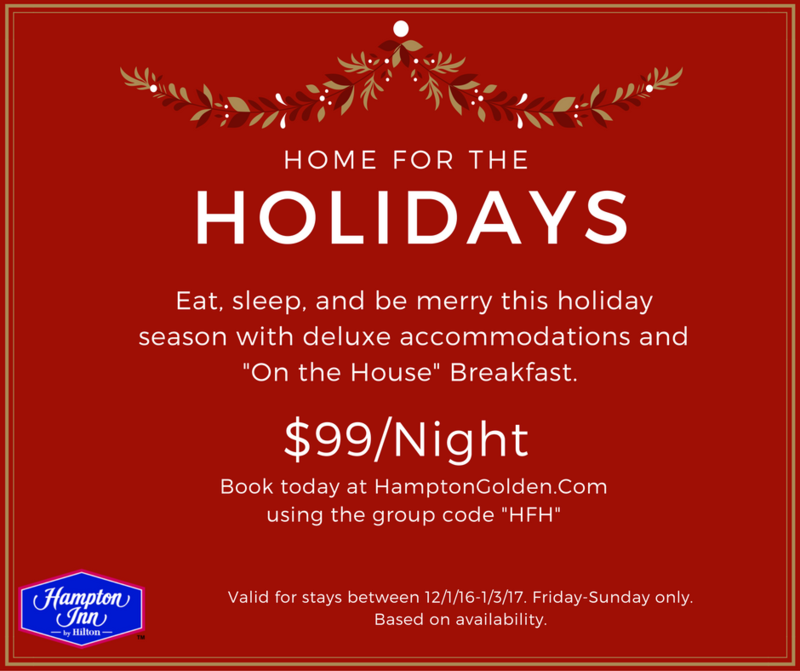 For more information, please visit http://www.hamptongolden.com. Package code is “HFH.” Package is valid for stays between December 1st, 2016 and January 3rd, 2017, Friday through Sunday, only. This package is based upon availability. Hampton Inn by Hilton Denver West Golden is an ideal destination for a Rocky Mountains getaway or a great place to destress while traveling for business in Denver. Indulge in plentiful amenities, including complimentary breakfast and Wi-Fi, a fitness center, indoor pool, 24-hour Suite Shop Pantry and much more. Located just twenty minutes from downtown Denver and right at the base of the foothills, Golden has a lot to offer travelers this holiday season. For more information or to make a reservation, please visit http://www.hamptongolden.com or call (303) 278-6600. The Hampton Inn by Hilton Denver West Golden is proudly managed by Stonebridge Companies in Denver, Colo.